This week the world celebrated International Women’s Day. While we advocate celebrating women every day of the year, it was a special opportunity to appreciate those closest to us. It was also an eye-opening day to celebrate women around the world who are doing unique things, especially in relation to carpeting or flooring. Knox Carpets prides itself on being sustainable where possible, both in the materials that we source and the process efficiencies on which we operate. These range from the way we work in the warehouse to the way that we communicate with each other and with our customers. We see sustainability as a responsibility for any companies in the product creation space. We will spend other blog posts discussing this issue at length, today we want to focus on an initiative founded and run by women, which is making quite a splash in industry news. It’s called the Afghan Carpet Project and it shined a spotlight on six carpets, sized 6×8, which were designed by contemporary artists based out of Los Angeles, California. Their names are Lisa Anne Auerbach, Meg Cranston, Francesca Gabbiani, Jennifer Guidi, Toba Khedoori and Liz Craft. Their designs were brought to life by weavers in Afghanistan. While Knox Carpets focuses time and effort on ensuring that our products are durable and well-priced for the value, we can’t help but ooh and ahh when we’re introduced to truly beautiful rug works of art. We know the time and effort that goes into their creation, but this project takes it to a whole different level. The project first began with a trip to Afghanistan in March 2014. The goal was to visit with weavers in Kabul and Bamiyan. The trip was incredibly eye-opening for travelers. They left with a multitude of insights into both the design and the production processes. They also left with newfound respect for the working and living conditions that the weavers spend their days and nights in. Each artist was tasked with creating an original design. Many reflected on the experience and wove (no pun intended) their story into the art. Others went with a method route, and designed their rug with the weavers specific practices in mind. The entire initiative was backed by AfghanMade, a non-profit organization and carpet producer Christopher Farr, Inc. The ultimate goal? Collaboration with women weavers all over Afghanistan. Once the fabrication costs of the rugs are covered, all proceeds from their sale will go to an organization called Arzu Studio Hope. Arzu Studio Hope establishes weaving studios throughout Afghanistan. Each of these prides itself on providing healthcare, providing an education, providing fair waves to Afghan women. 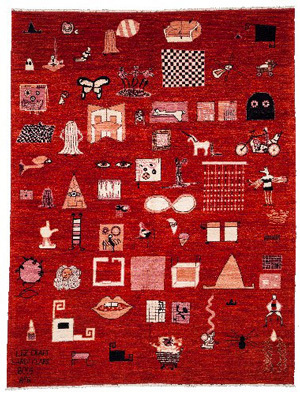 The exhibition was on display at the Hammer Museum, but you can take a look at the carpets, here. Each rug was produced in quantities of five. One of each style will be kept at the Hammer’s permanent collection. Each artist will receive one as well. These rugs are priced at $9500.